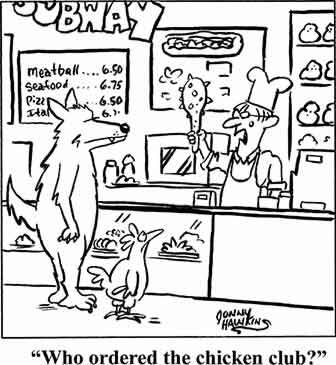 Predators can be a constant worry for many small holders and poultry keepers. A single fox can ruin years of careful husbandry and breeding in a few minutes, and stoats think little of killing a broody hen as she sits on eggs. We all know the dangers posed by these two hunters, and with a little care and attention, we can keep them back with a combination of electric fences, traps and deterrents. However, an equally harmful predator lurks in the wings for many poultry keepers, and while mink numbers are reported to be falling, the danger remains a serious one. Originally from America, mink were brought to Britain to provide a ready supply of skins for the fur trade. They are extraordinarily adaptable animals, and they survive in the British countryside after a series of deliberate releases which took place when the market for fur began to fail in the 1960s and 1970s. Within months of being released, mink were found to be breeding. Over the next forty years, they spread so that only a few of the most remote areas of the Scottish highlands are still free from these voracious hunters. Mink will eat very nearly anything. Naturally disposed to spend time around water, they quickly cleared water voles from many of their traditional haunts, and the impact that they have had on any number of riverbank species has been devastating. Physically, mink resemble a cross between a ferret and an otter, and some have been found to be extremely large, measuring almost three feet long. They are found in a variety of different colours, but the most common is a rich chocolate-brown with a small white chin. Unlike foxes or otters, mink appear to have little fear of humans, and while they will never attack a person, they have been found in sheds and outbuildings which are regularly visited by man. While mink are predominantly riverside animals, they will use streams and rivers as highways across the countryside, heading out for some distance over dry land to hunt. The risk they pose to poultry flocks is great, and as soon as they find your birds, they will go into a frenzy of killing. Unless you are prepared to trap pre-emptively on local streams and rivers, the first sign you will find of a mink in the area is dead birds. Mink are powerful, and they make short work even of large duck breeds. They will usually focus their attention on the back of a bird’s neck, and they will continue to kill without feeding until they have exhausted themselves. You can be relatively sure of a mink attack if there are signs of an extended struggle, if birds have broken skin on their heads or necks, and if there is no sign of a forced entry in the wire or walls of your poultry run. Chicken wire is no obstacle to these predators, and they will fit into the tiniest nook or cranny with ease. 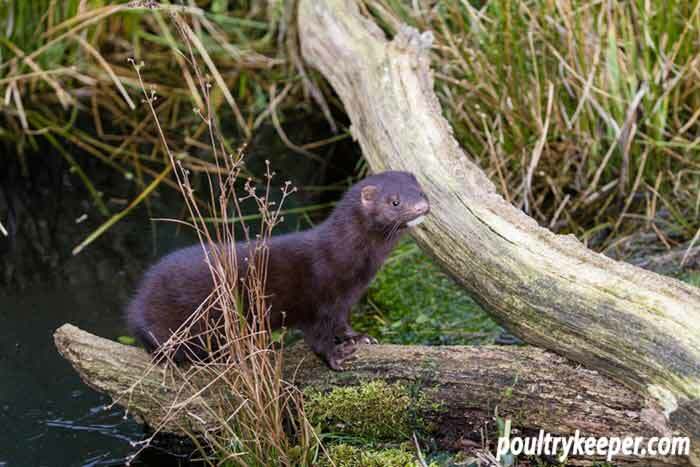 If you have come across signs of mink in or around your poultry buildings, it is often a good idea to find out if a programme of mink trapping is in operation locally. Many local community groups trap mink together in the name of local wildlife. They may be keen to hear of mink activity, and they could even be encouraged to trap your mink for you. In most cases, however, you will have to trap it yourself. Mink traps come in a variety of shapes and sizes, and some are designed to catch humanely while others will kill. As a destructive non-native species, mink cannot be re-released into the wild, and legal penalties are in place to prevent this from happening. 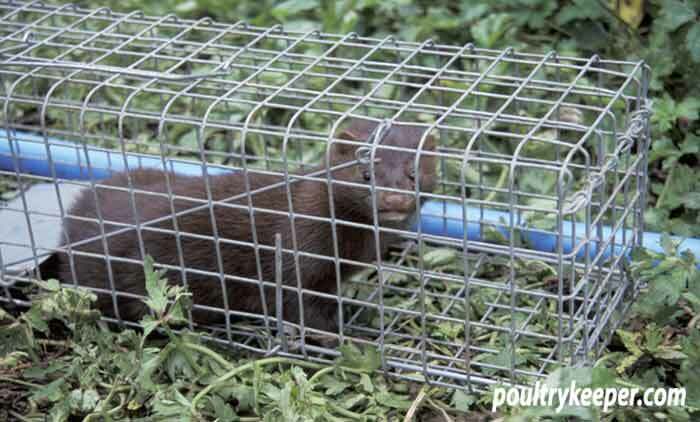 If you catch a mink in a live catch trap, you must be prepared to despatch it humanely. Both live catch and lethal spring traps need to be set inside a tunnel, not only to reduce the risk of catching a non-target animal, but also to draw the mink inside. Mink are naturally intrigued by dark little corners, and even without bait they will explore an artificial tunnel provided that it is well camouflaged with local materials. 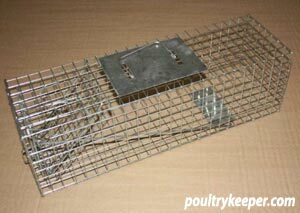 Galvanised mesh live traps are the most popular way of trapping mink, and while these are commonly used on riversides, if you are confident that a mink is visiting your hen runs, they can be put to good use along the side of a shed wall or in a conspicuous tunnel made from stones or wooden boards. For extra efficiency, bait the trap with fish guts or rotten fish remains which the mink will find utterly irresistible. It is always devastating when your birds are killed by predators, and given that they appear to cause wanton and wholesale destruction, a visit from a mink can often be particularly distressing. Provided that you are prepared to meet the threat head on, you will quickly trap the offending mink, but you should be aware that catching one mink may not solve the problem. If your birds are within striking distance of a mink stream or river, year round control may be necessary.